When you use AMD K6-II CPUs rated higher than 350MHz for your system running Windows 95B or 95C, you need amdk6upd.exe . P55C-K6-S1 Photos are donated by Jim Hall.
" For those of you who haven't seen this upgrade, it consists of an interposer similar to the Madex, with a plug for a power tap used on 3 1/2" clone style floppy drives to handle the power requirements of the Intel (or any pin compatible) CPU. The cooling fan also draws its power from the same source. " Exactly the same product was also sold in Japan before. it was named as "Multimedia CPU Upgrade Kit ". It was made of Taiwan and marked as "CE". I don't know this "CE" logo which can be seen many computer products manufactured in Taiwan. 3.3V single voltage for I/O and Core is not designated. Thus Jim set Core voltage to 3.2V and put his classic Pentium P-166 with 3x speed jumper setting and set it on his Y complex. Y complex has 60 MHz OSC so his system actually run at 180 MHz. "OK, ran a little windows program called CPU id, by Alexander Berezkin. 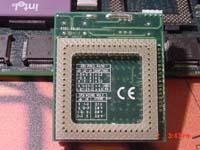 It identifies the cpu as an Intel Pentium, brand name GenuineI ntel. Clock Frequency, Internal = 180 MHz "
Careful with that axe, Eugene. Connection pins for SPGA socket are shorter than the others. Kingston TurboChip 233 uses Intel MMX233 CPU. Onboard voltage regulator to interface with either 2.8V or 3.3V system motherboard automatically. “Plug and Play” installation. No software drivers to install. Unfortunately TurboChip 233 does not have CPU speed jumper and it will automatically set the clock multiplier to 3.5x . 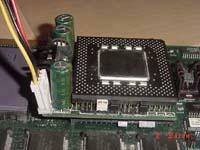 It is supposed that TurboChip 233 may not run on Y complex. Any experience ? 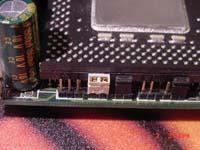 TurboChip 200 uses AMD K6 200MHz. Most possibly, It will be kicked out by system BIOS of Y complex. 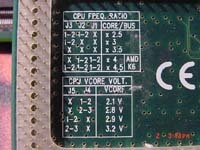 Turbochip 400 uses K6-II/400 CPU. Needless to say it's incompatible with type-4 Y complex. But it may run in PC Server 320/520 or PC750 6886. 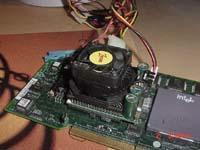 There were several models rated 300MHz to 400MHz using K6-II CPUs like Kingston TurboChip. it to Max rating provided with the CPU used..
default to the 3.5 multiplier if left unconnected. Sampled BF[2:0] are sampled during the falling transition of RESET.